A recent business trip to Chicago provided just enough free time to enjoy a few meals on my own. After hours spent "virtually" eating my way through the city via Urbanspoon and several enticing local blogs, I narrowed my search to three or four likely candidates. Not willing to fight the crowds at Top Chef Stephanie Izard's white hot Girl & The Goat, I was in search of a unique dining experience, preferably within walking distance of my hotel, hoping to feed my iPhone picture taking habit while also getting some sorely needed exercise (I consider it way to beastly hot to walk more than a block outdoors in Jacksonville most of the year). I settled on Iron Chef Jose Garces' Mercat a la Planxa in the recently renovated Blackstone Hotel, where the signature offerings are Catalan tapas and grilled to order seafood and steaks. Two words: GOOD CHOICE. These days, the mod Michigan Avenue spot is in the capable hands of Chef de Cuisine Michael Fiorello, who just days after my visit was crowned Chicago's "Porc Prince" at Cochon555 Chicago. Chef Garces does make the odd return visit as well, I'm told. Settling in to my table on a Friday mid-morning, I felt instantly at home in the space. As the lunch service began I perused the menu and made my selections. Arriving in record time, the Serrano Ham and Fig salad was beautiful to look at AND one of the best salads I've eaten in recent memory. 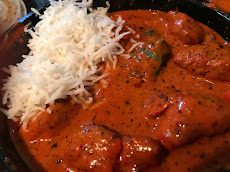 The flavors melded well, yet each stood out on its own. 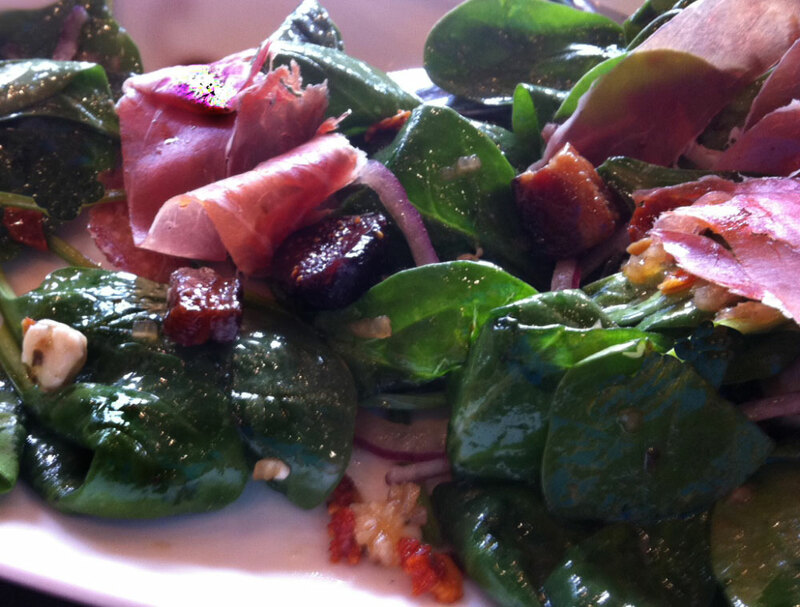 Sweet, salty Serrano ham was arranged as petals over a bed of baby spinach, studded with firm bits of smoky lardon and chewy fig. 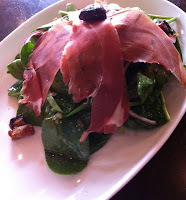 Subtle, creamy Spanish blue La Peral and a nutty, tart sherry vinaigrette rounded out the flavor profile. I am pretty sure I licked the plate clean. Choosing a main course was simple once I saw the words Potato Croquette, Hanger Steak AND Braised Short Rib - on the same dish... Add in a Mushroom Escabeche? I was perplexed as to how this dish was ever going to come together. When it arrived, all packaged neatly in one layered piece, it all made perfect sense. A healthy portion of Black Angus Hanger Steak is grilled to order, and tops a satiny short rib braise, which in turn rides atop the long, crisp plank of potato. The mushrooms are sprinkled on top of that, and the whole thing is dusted with herbs and plated with brightly colored infused olive oil. This is a great dish for lunch but would also be easy to slice up and share as tapas. The ambiance at Mercat at early lunchtime was one of warmth and relaxed elegance. 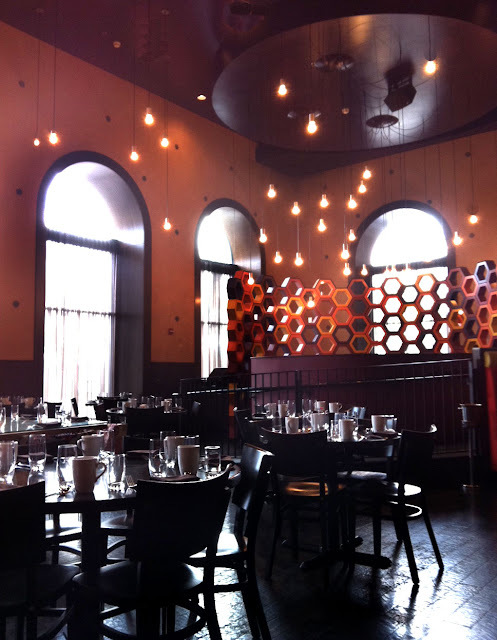 Light streamed from the tall windows and made sihouettes of nearby diners. The service was impeccable, and I felt like I was on my own little island, where I was welcome to relax and stay as long as I liked, eat as much as I could hold. Eventually, however, meetings beckoned, and I reluctantly surrendered my cozy corner table and eased out into the brisk March air for the short 11 block walk back to my hotel, snapping pics of buildings and their fabulous architectural details all along the way. I probably drove my friends crazy posting all the pics on Facebook and Instagram, but I was inspired. Maybe it was the cool crisp air. Or maybe it was the meal. It all just fit beautifully together into one lovely visit to one of my favorite cities. I love Chicago. Next visit, I'll most likely stay at the Blackstone. 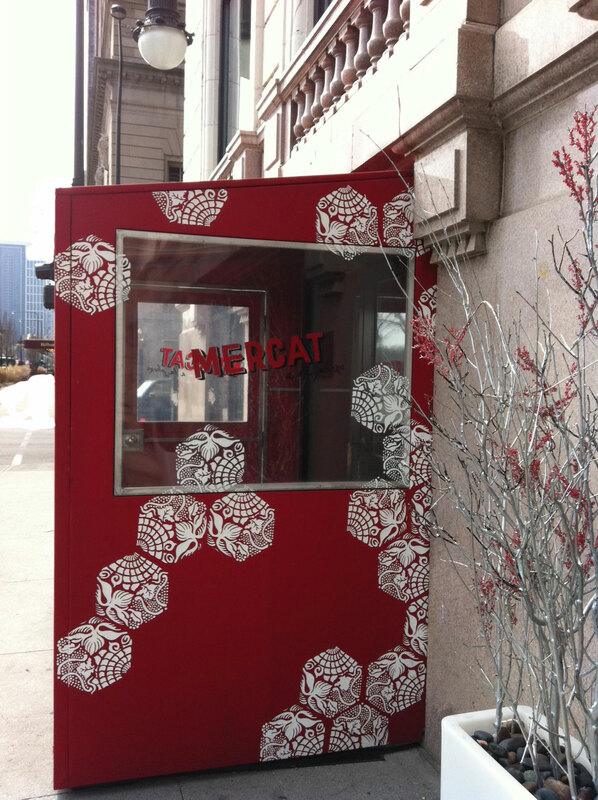 I hear Mercat has a great brunch. One week a year our little beach town plays host to a big-deal sporting event - THE PLAYERS Championship at TPC Sawgrass. A1A, our one main thoroughfare, gets a steady stream of visitors to and from the course, and locals hunker down to defend their favorite watering holes, or head to parts unknown to wait out the onslaught. I may not know a lot about golf, but I do know where visiting fans can get some decent chow and a glass of beer around here. 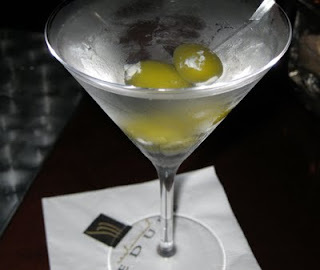 So without further ado, I present my not the least bit comprehensive guide to Ponte Vedra and Palm Valley restaurants and night life - with apologies to the locals for outing some of our best kept (not) secrets. 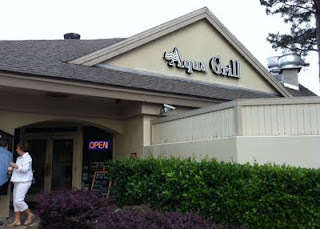 aqua grill - a stone's throw from the course. Assuming you're staying in Ponte Vedra, and looking for something outside your hotel, but close to the action, Sawgrass Village staples Aqua Grill and Caffe Andiamo are two excellent choices. "Aqua" is a well established, locally owned and operated upscale-casual, come as you are kind of place, with good service and something for everyone on the menu. There is a large locals crowd in the bar - and they can make a roar, but they won't bite. C'mon out and meet some good people. A great choice for seafood, bar bites, outdoor patio, and casual hang-time. 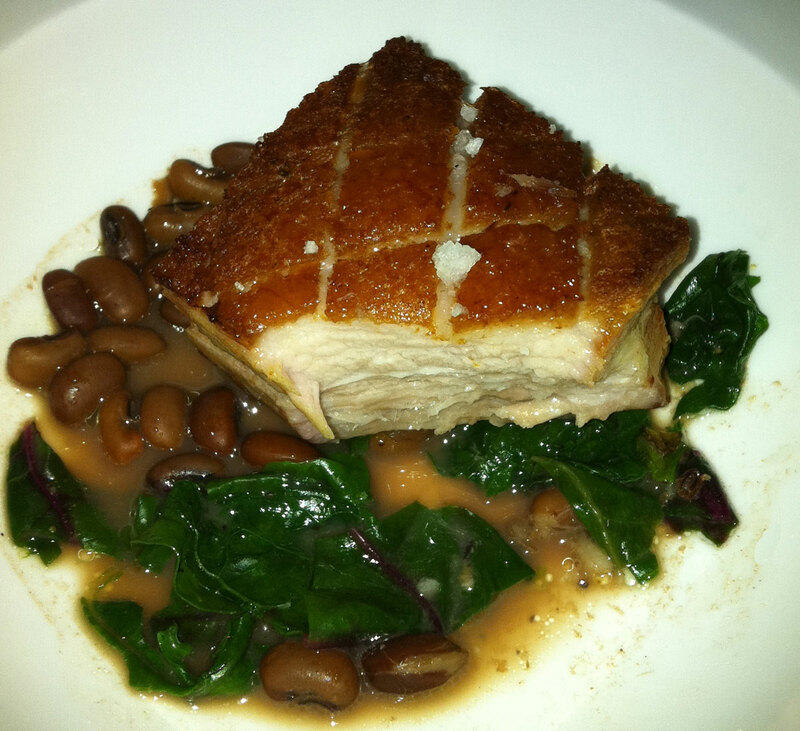 At nearby Caffe Andiamo, skip the dinner menu (mediocre at best) and head straight to the bar. Grab an adult beverage, then order the artichoke appetizer and their wood-grilled pizzas. THIS is some of the best pizza in town. They have a small patio but it has a view of the parking lot. The Augustine Grille at Marriott Sawgrass is not dishing out your typical hotel fare. If you're looking for the white tablecloth, upscale dining scenario, this is your go-to joint. If you can't get in, or just want to get out, make reservations at Restaurant Medure, just south of Sawgrass. 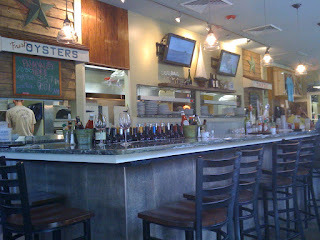 Excellent locally owned, one of a kind spot, with live music in the lounge most weekend nights. If you don't have a chain steak house back home and simply must feel the magic, Ruth's Chris Steakhouse is searing up some pretty good stuff a few doors down. But for my money, Medure is the much better choice. If you are in the mood for some seafood (and who isn't) you are in the right place. Palm Valley Fish Camp on Roscoe Road is the sure-fire favorite when it comes to fish and seafood. 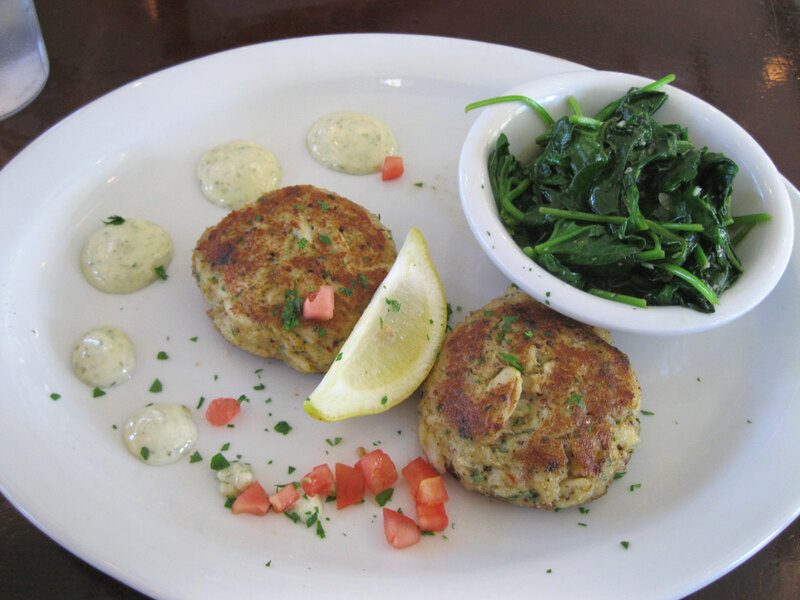 Every place has crab cakes on their menu, no one has crab cakes this good. Fresh ingredients, simply prepared. Casual atmosphere. Make a reservation - but if you happen to be driving by and get the urge - if there's an open parking space, take it and get in there! If you want to enjoy some waterfront scenery while you dine, but you don't have a membership to the beach club, make your way to The Bridge Waterfront Bistro. Good choice for lunch, and for the view. Mixed reviews on Urbanspoon about their dinner service, but I can say the fish is outstanding and I've never gotten a bad meal there. Come the weekend, we'll all hang on every swing to see who's going to win it all. Will Tiger play, won't he, will the hometown fave make it all the way, how many people we know will get tossed off the course for crude behavior? If you are without tickets but don't want to miss a shot, check out Ponte Vedra's only true sports bar - Bogey Grill. They've got the NFL Sunday Ticket, and a cajillion TVs, so you won't miss a bogey, shot, putt, drive, eagle or ace. Food is average sports-bar fare. There are plenty of places to wet your whistle here. A few stand out for one reason or another. Restaurant Medure has a great $5 bar bite menu in addition to their regular appetizers. And they know how to stuff an olive. Or head north on A1A and swerve in to Urban Flats for some inventive flatbreads and seriously good salads - another casual fave with a decent selection of wines-by-the-glass. Al's Pizza (on A1A) is generally regarded to be the best pizza in town. 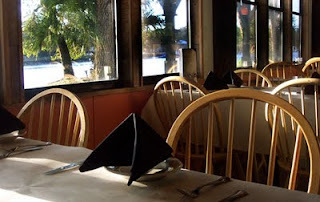 The dining atmosphere, however, is very... family friendly... so I usually place my to go order at the front, head to the bar for a glass of wine, and by the time I've finished sipping I've got a piping hot fresh pizza ready to go. Want to indulge in the sweet life? Make your way down A1A to JJ's Liberty Bistro, where the cases are full of fresh made gourmet dessert options. JJ's is a great choice for french fare at lunch or dinner, but what we mostly love about it is the cheese selection and the decadent desserts. And in the interest of full disclosure - nobody paid me anything to feature these places, no free food, no email pitch from their publicists. Just my own humble opinion. See you in Ponte Vedra, Beaches!